After my previous post about overcoming social anxiety when eating/socialising as a vegan, I got asked what I thought about people who are mostly plant based but aren't so strict when at social events. What my opinion on this is really doesn't matter because you need to do what is best for you and what works for you. But my personal opinion is that it is great. Even if people just eat plant based meals a few times a week that is awesome. Of course you aren't a vegan if you eat animal products sometimes but forget labels... you are not a label and having a vegan label doesn't make anyone better than another. For some people it works to eat plant based when at home but then not be too strict when eating out and I think that can be the perfect balance for some. I know that as someone who has an eating disorder in the past you don't want to be too strict with yourself or have rules or what you can or can't eat and being vegan can be too much and too strict for someone with a history of an eating disorder. Also if someone suffers from anxiety or social anxiety it can be easier to not have different demands or be "annoying" or to feel excluded because you can't eat what is being served. I'm sure for many they feel happier, healthier and balanced if they can just enjoy the bread with butter and some fish when dining out and not feel like an inconvenience or excluded. You make the decision that is best for you and you should never feel guilty for what you eat or how you choose to eat!! You shouldn't feel restricted or excluded just because of the way you eat and if eating some animal products means you have a more balanced and healthy life and social life, then that's what's best for you! Everyone can make small changes and differences and it doesn't have to be black or white or all or nothing!!! Always do what's best for you. 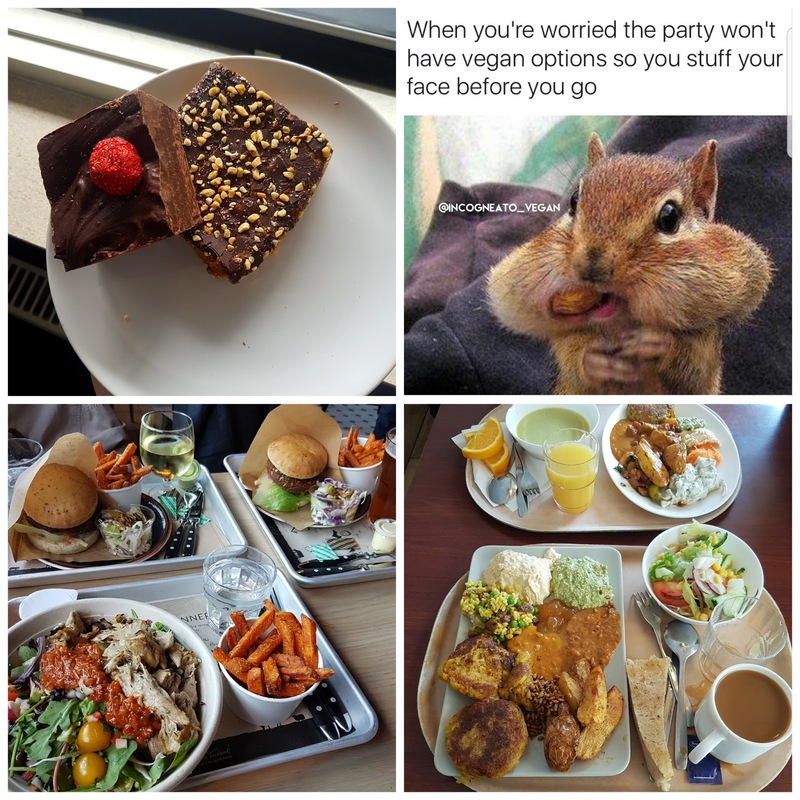 As you touched on in this post I don't think that I could go vegan at the moment anyway without feeling like it might just be a way of restricting myself- and my family would certainly be suspicious. Because dairy products were something I cut out when I was restricting and I'm now enjoying eating cheese and yogurt again, I know you can get a vegan version of most things though. But at least while I still live at home I don't want to be a limiting pain again like when I was ill on what everyone else is cooking for meals. I've always been vegetarian though. :) I think its important to bring up because far too many vegans think "all or nothing" or think that "flexitarians" are silly... but i think that people can only do what is best for them and small choices or changes still make a difference and health should come first as well as balance being different for everyone! Discovering all the different vegan food you can have and make has been like an adventure for me, and such a change from my usual way of eating. I can understand though that eating as a family it may then be difficult but when you are catering for only yourself it is a lot easier - you don`t have that feeling you have to fit in with everyone else ie your family and basically what ever you choose to eat is up to you, no one else. Do you think just catering mainly for yourself Izzy made your transition to a vegan diet easier and less complicated? How did the vegan exhibition go? was it good? There are many different currents and food options. But I believe that the best way is to balance the proper nutrition. I have been eating more plant based meals lately and have noticed a huge difference in my skin and energy levels - I no longer get that heavy feeling after meals like I used to get when eating meat and my meals are far more varied now! There is such a wide scope for plant based and its exciting trying out the new and different foods - thank you for your influence Izzy! If you hadn't posted the information you have I doubt I would have tried it as it all seemed alien to me at first. Just goes to show you don`t know unless you try!